We’d love your help. Let us know what’s wrong with this preview of The Cat Who Came in off the Roof by Annie M.G. Schmidt. An act of kindness brings shy reporter Mr. Tibble into contact with the unusual Miss M In the tradition of The Cricket in Times Square comes this charming tale of courage, friendship, and what it really means to be human. This classic, which originated in Holland and has withstood the test of time worldwide, will appeal to readers young and old—and dog and cat lovers alike! 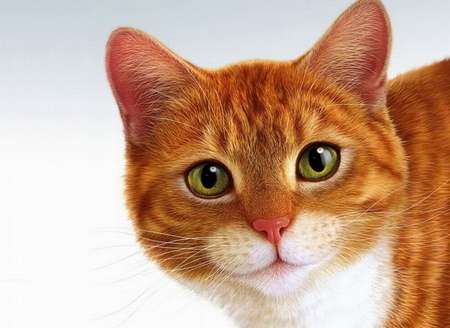 To ask other readers questions about The Cat Who Came in off the Roof, please sign up. Annie M.G. Schmidt, who died in 1995, was a beloved and well-respected author in the Netherlands, her native land. In 1988 she won the Hans Christian Anderson Award, the most distinguished international award in children’s literature, which is granted to authors and illustrators whose body of work has made a lasting contribution to children’s literature. Unfortunately, until now Schmidt’s work has not been published in the English language, so she is not well known in the U.S. That may change with the 2016 publication of her 1970 book, The Cat Who Came In off the Roof (Dutch title: “Minoes”), translated by David Colmer. Tibble, a painfully shy reporter, is on the verge of losing his job with the Killenthorn Courier newspaper: his editor is tired of his articles about cats (“there’s never any news in them!”). The problem is that Tibble is too introverted to approach and talk to people and find out actual news in his town. On his way home he helps an attractive young redheaded woman who has been treed by a furiously barking German Shepherd. When he finds her later that evening rummaging for food in his garbage bin, soaked with the rain and stuffing a large fish skeleton into her mouth, he feels sorry for her and invites her into his home to dry off and share a meal. This mysterious young lady, who introduces herself as Miss Minou, tells Tibble that she can talk to cats because ... she was once a cat herself. Tibble considers her “totally bonkers,” but he has to admit she has an unusual ability to communicate with his cat Fluff. So he lets her stay the night, curled up in a large box lined with fresh newspaper. On her way to bed, Minou mentions that another cat, Cross-Eyed Simon, told her that his owner, a schoolteacher, is depressed because no one in town has remembered his twenty-fifth anniversary as head teacher at the local school. And suddenly Tibble has his first legitimate news story. His editor is delighted, and Minou develops an awesome ability to glean all the latest news from the local population of cats, who watch what their owners do and say. “Thanks,” said Minou. He’d been sitting in on the history lesson again. So Minou stays with Tibble and feeds him news scoops while he feeds her fish. This arrangement works out well for everyone involved, although Tibble has some trouble with trying to break Minou of overly cattish habits like rubbing up against people and stalking birds and mice. Minou herself is torn: she can’t decide whether she wants to remain a human or ― assuming she ever gets the chance ― go back to being a cat. But when the local cats find out that Mr. Ellmore, the president of the local Animal Lovers’ Association, is not only cruel to animals (when no one else is looking, of course) but is committing criminal acts, it will take the combined efforts of cats and humans to try to bring his nefarious deeds to light. "Wash yourself with spit. Lick yourself. That is the beginning and end of all wisdom." In its original Dutch form, The Cat Who Came In off the Roof was the 1971 winner of Dutch Zilveren Griffel (Silver Pencil) literary award for children’s literature. It was the basis for the popular 2001 Dutch film Minoes, which was later dubbed and released in an English version under the titles Miss Minoes and Undercover Kitty. This charming fantasy novel is written at a middle grade level, but the humor and deft characterization of the local cat population will endear it to adults as well as children. It’s a simple but heartwarming tale, and a must-read for anyone who loves cats! Poor Mr. Tibble works for the Killenthorn Courier and his boss has told him he will be fired if he doesn't go out and get real stories. All he writes about are cats and anything nice. He's too shy to go around talking to people and finding stories for the paper. One day when he's walking home he is talking to a man and out of the blue runs a woman being chased by a dog and she flies up a tree at an incredible speed. Mr. Tibble soon gets her down but wonders how in the world did she get up that tree so fast. That same night he is pacing his attic apartment talking to his cat Fluff about being fired if he can't come up with something. Later on that night he hears a noise in the kitchen and he finds the lady digging through his garbage can! She said her name is Minou and he fixes her something to eat and finding out her story. Her story is so incredible that he can't believe it until she helps him with his job and he becomes a great writer for the paper. Mr. Tibble and Miss Minou go through a bunch of stories and scrapes together along with a large assortment of friends. I loved it, it's such a sweet little story and it even has some good lessons about the caring of animals in the book. Unpopular opinion here, but I didn't really care for this book. I was a nanny for many years and I have read my fair share of children's books. What I have come to learn is that just because a book is for children doesn't mean it has to be overly simple or lazy. Unfortunately I found this book to be just that. The writing was very stilted and while the plot had potential I found it to be rather boring. I realize that I am far from the target audience, but there are just so many other children's books out there that are entertaining for the parent and the child that I don't feel the need to settle for yawn inducing books. What good fortune that Delacorte Books for Young Readers chose to reissue Annie M.G. Schmidt’s The Cat Who Came in off the Roof, a charming tale of a timid newspaper reporter and the clever but mysterious woman who comes to his rescue! Originally published in Dutch in 1970, this children’s story has lost none of its charm in the ensuring five decades. In danger of losing his job for typing out nothing but stories about cats, the excruciatingly shy Mr. Tibble has been directed to get past his rel What good fortune that Delacorte Books for Young Readers chose to reissue Annie M.G. Schmidt’s The Cat Who Came in off the Roof, a charming tale of a timid newspaper reporter and the clever but mysterious woman who comes to his rescue! Originally published in Dutch in 1970, this children’s story has lost none of its charm in the ensuring five decades. In danger of losing his job for typing out nothing but stories about cats, the excruciatingly shy Mr. Tibble has been directed to get past his reluctance to interview folks and bring home some real news to the Killenthorn Courier, the town’s newspaper. A chance encounter with a pretty redhead named Miss Minou gives Tibble the big break he needs; so as not to spoil things, let’s just say that Miss Minou is able to find out scoops due some very unusual abilities. I know that readers — be they young or simply young at heart — will find Miss Minou and Mr. Tibble as irresistible as I did! A fantasy story about a cat who becomes a woman when she eats something out of the rubbish bin outside "The Institute". When Tibble, a newspaper reporter, rescues Minou from a tree after being chased by a dog, she moves into his attic apartment. When Tibble is almost fired from his job for only writing about cats, his boss gives him one more chance. Minou is still able to communicate with cats. She hears what's going on around town by speaking to them and passes the information on to Tibble. He A fantasy story about a cat who becomes a woman when she eats something out of the rubbish bin outside "The Institute". When Tibble, a newspaper reporter, rescues Minou from a tree after being chased by a dog, she moves into his attic apartment. When Tibble is almost fired from his job for only writing about cats, his boss gives him one more chance. Minou is still able to communicate with cats. She hears what's going on around town by speaking to them and passes the information on to Tibble. He is now able to write breaking news stories, thus keeping his job. But when he has a story about a local bigwig doing something wrong with only cats for witnesses, he has to decide if he will write the story or not. He finally decides he will and then must decide whether he will stand by it or not. Minou is also given the opportunity to turn back into a cat and must decide if she wants to change back or stay a human being. This is a good book about a woman who used to be a cat. The author is supposed to be the children's book author that everyone in the Netherlands reads. She has won the Hans Christian Anderson Award. I am not sure if this is not the best example of her work, or if the translation is not the best that it could be, because although it was a pleasant read, it was just that, pleasant. The story is of Minou, the former cat, and the human that takes her in Mr. Tibbles, who writes for the local town newspaper. He only wants to write about cats, because he is so shy, and since Minou can talk to cats, and the cats want to help him, they feed him news stories, which works out better than writing about cats. As I said, there is nothing wrong with the book, and it is cute, but It isn't likely something I would reread, as I would the Moomin books, or E. Nesbit. Een poes die een mens wordt. Dat komt uit de fantasie van Annie M.G. Schmidt. Het boek was voor mij jeugdsentiment. Voor mijn kinderen is dat nu. En de film Minoes wordt bij ons ook regelmatig bekeken. My first dutch. It was fun but I would say I only understood, like, 20 percent? I enjoyed it nevertheless. De verlegen journalist Tibbe krijgt een juffrouw inwonen, Minoes, die vroeger kat is geweest en zich nog steeds vaak als kat gedraagt. Zij helpt hem via de "katten-persdienst" aan nieuws. Fantasievol, met schitterende vondsten, geweldige personages (zowel mensen als katten), en een spannend en lief einde. Een heerlijk boek! En deze klassieker nóg maar 's gelezen. En weer een heerlijk boek, waarvan het eind zo verrekte jammer is dat je het uithebt, zeker als je er maar een paar uur eerder aan was begonnen. Zowel de lieve 'katse' hoofdpersoon als het boek zijn om te zoenen. Na het zien van een stukje van de film is de wil weer zeer groot om dit magistrale kinderboek nog eens te lezen. Tibbe en de Jakkepoes en natuurlijk vooral Minoes zelf zijn onvergetelijke karakters en de scenes van een verzopen Minoes met een visgraat, Minoes en de muis en Minoes met de sleuteltjes het keer op keer herlezen meer dan waard. First book read in 2017! Not a bad start of the year... Funny story about this book, my boyfriend was vacationing with his family to Paris on the new year's and visited the Shakespeare and Co. bookstore. He thought, Oh, I know my girlfriend loves books, so I'm gonna buy her one. But he knows that I read so much, that he's afraid I will have already read the book he'll choose. So what does he do? He goes to the children's section and buys the book he think I'll love most. And, since he knows I lo First book read in 2017! Not a bad start of the year... Funny story about this book, my boyfriend was vacationing with his family to Paris on the new year's and visited the Shakespeare and Co. bookstore. He thought, Oh, I know my girlfriend loves books, so I'm gonna buy her one. But he knows that I read so much, that he's afraid I will have already read the book he'll choose. So what does he do? He goes to the children's section and buys the book he think I'll love most. And, since he knows I looooove cats, he buys one that has the word cat in the title. What an amazing man. Anyway, moving on to the book itself. This is a translated children's book about a shy reporter (didn't know those existed) who loves cats, and meets a cat who was turned into a human. The story revolves around his adventures writing articles with the help of the city's cats and his relationship with the cat-turned-human. First sentence: "Tibble! Where's Tibble? Has anyone seen Tibble? The boss wants to talk to him. Where's he got to? Tibble!" Premise/plot: Don't mistake Tibble for a cat; he's a very human reporter for a newspaper. If he can keep his job that is. Tibble's news stories don't qualify as "news" according to his boss. But his reporting takes a turn for the better after he befriends a young woman, Miss Minou. He first sees her up a tree. Up a tree?! Yes, she'd been chased there by a mad dog. And that i First sentence: "Tibble! Where's Tibble? Has anyone seen Tibble? The boss wants to talk to him. Where's he got to? Tibble!" Premise/plot: Don't mistake Tibble for a cat; he's a very human reporter for a newspaper. If he can keep his job that is. Tibble's news stories don't qualify as "news" according to his boss. But his reporting takes a turn for the better after he befriends a young woman, Miss Minou. He first sees her up a tree. Up a tree?! Yes, she'd been chased there by a mad dog. And that isn't the only odd thing about Minou. She also likes to climb in and out of windows, hang out with cats on the roof, and sleep curled up in a box. The premise of this one: Minou used to be a cat; now she's a human. She can still communicate with cats--hence why Tibble is suddenly good at his job. All the cats in town are talking to Minou about their humans, what they see and hear. My thoughts: The Cat Who Came In Off the Roof is newly translated into English; it was originally published in Dutch in 1970. This is an odd little fantasy for children. But overall I liked it. Tibbles meets Minou when she "came in off the roof" and into his window. If Minou were still a cat, it wouldn't be odd that he takes in a stray. He keeps her because she's super useful to him. Not that knowing her is without risk: Minou doesn't make a good impression on most people. For one thing, she rubs herself against people--literally. Tibbles keeps trying to train her to be more human and less cattish. Kedua... saya membaca I Was A Rat karangan Philip Pullman. Seorang bocah laki2 berkeluyuran mencari rumah manusia yang mau menampungnya dengan masih menyimpan memori sebagai tikus. Bukan tikus sembarang tikus, dia tadinya adalah salah satu tikus yang ditugaskan mendampingi "Cinderella" ke pesta dansa istana. Ketiga... kini ada Juffrow Minoes, cewek Belanda. Dia bingung, sebagai kucing rumahan berbulu oranye, kok dia bisa berubah jadi gadis muda? Gayanya rapi, tuturannya santun, tapi lebih senang tidur meringkuk di kardus, kabur memanjat pohon setiap dikejar anjing, dan mupeng berat tiap ada godaan murai berkicau. Tapi Minoes punya jasa besar bersama kucing2 di kota (favorit saya si Kucing Sekolah yang sotoy karena demen nongkrong di jendela kelas saat pelajaran sejarah!)... menyelamatkan karir Tibbe sang jurnalis dan menyelamatkan kota dari ancaman kapitalis rakus yang menyebalkan. Very cute! Full review to come. "Saya juga mau dong punya kontributor berita kucing-kucing lucu. Terus jadi wartawan terkenaaalll...!!! >w<"
Begitulah yang ada di benak saya setelah membaca "Minoes". Sebuah cerita yang penuh dengan kucing... kucing... dan kucing! Mulai dari Kucing Pom Bensin, Kucing Deodoran, Kucing Hotel, Kucing Balai Kota, dan kucing-kucing lainnya. Tentu saja penuh dengan kucing, karena tokoh utama kita kali ini "dulunya" adalah seekor kucing! Hhhmm... Seperti apakah ceritanya? Mari simak review saya d "Saya juga mau dong punya kontributor berita kucing-kucing lucu. Terus jadi wartawan terkenaaalll...!!! >w<"
Begitulah yang ada di benak saya setelah membaca "Minoes". Sebuah cerita yang penuh dengan kucing... kucing... dan kucing! Mulai dari Kucing Pom Bensin, Kucing Deodoran, Kucing Hotel, Kucing Balai Kota, dan kucing-kucing lainnya. Tentu saja penuh dengan kucing, karena tokoh utama kita kali ini "dulunya" adalah seekor kucing! Hhhmm... Seperti apakah ceritanya? Mari simak review saya di bawah ini. Minoes adalah "seekor" manusia yang terjebak di atas pohon setelah seekor anjing bernama Mars mengejarnya. Minoes tidak bisa turun, layaknya seekor kucing yang terperangkap. Ya, dia dulunya memang seekor kucing. Entah apa yang terjadi, tiba-tiba dia terperangkap di dalam tubuh manusia. Karena diusir oleh keluarganya, Minoes pun terpaksa pergi dari rumah dan hidup di jalanan hingga mendapatkan tempat tinggal. Adapun orang yang berbaik hati menurunkan Minoes dari pohon adalah seorang (kali ini bukan seekor ;p) lelaki muda yang sangat pemalu bernama Tibbe yang bekerja sebagai wartawan. Padahal wartawan kan harus berani berkomunikasi dengan orang banyak ya? Tapi si Tibbe ini beneran pemalu. Saking pemalunya, semua berita yang ditulis hanya mengenai kucing saja. Bosnya tentu tidak senang dengan hal ini, karena meskipun tulisannya bagus, berita tentang kucing yang beranak lima tentunya tidak menyenangkan untuk diterbitkan di surat kabar bukan? Akibatnya, Tibbe terancam akan dipecat jika ia menulis berita tentang kucing lagi. Minoes pergi menemui tantenya, Tante Moortje, yang tentunya adalah seekor kucing. Tante Moortje sudah mengetahui kemalangan yang menimpa ponakannya itu. Seluruh kucing di kota tahu, meskipun Minoes tidak tinggal di sana. Tante Moortje menyuruh Minoes untuk bertemu si Burik, kucing liar di kota yang memiliki pengetahuan sangat luas. Ia hidup bebas dari satu tempat ke tempat lain. Anaknya pun banyak dan tinggal di seluruh penjuru kota, karena itu ia memiliki banyak akses kemana-mana. Berkat rekomendasi dari Simon, kucing siam bermata juling, Minoes memutuskan untuk pergi ke rumah Tibbe. Tidak dengan cara manusia normal yang masuk melalui pintu tentunya, karena Tibbe menemukan Minoes di dapurnya sedang menggerogoti tulang ikan bekas makan malamnya! Pertemuan yang luar biasa itu membuat Tibbe sangat terkejut. Apalagi saat itu Minoes dalam keadaan basah kuyup karena kehujanan. Minoes datang ke rumah Tibbe dengan harapan lelaki itu dapat memberikan pekerjaan padanya. Suatu hal yang mustahil! Karena keadaan Tibbe sendiri pun sedang berada di ujung tanduk. Minoes bercerita tentang dirinya, tentang masa lalunya yang adalah seekor kucing. Tibbe tentunya tidak percaya dan menganggap itu semua adalah bualan gadis itu belaka. Meskipun ketika melihat Minoes, ia langsung melihat bahwa gadis itu "terlalu kucing" untuk seorang manusia. Minoes masuk ke rumahnya melalui atap, Minoes mengorek-ngorek tempat sampah untuk mengambil tulang ikan, Minoes menjilat bersih jarinya setelah makan, Minoes mendengkur seperti kucing, Minoes menyorongkan kepalanya ke arah Tibbe seolah minta dibelai, dan yang paling penting, Minoes bisa bercakap-cakap dengan kucing!! Tibbe tentu saja menganggap gadis itu sudah gila. Bagaimana mungkin seorang manusia bisa bercakap-cakap dengan kucing. Tetapi Minoes benar-benar bisa. Ia telah bercakap-cakap dengan Fluf dan tahu di mana letak permen peppermint Tibbe yang tidak bisa ia temukan. Dan Minoes menyelamatkan hidup Tibbe, dengan membawa berita! Berita yang dibawakan Minoes tidak ada hubungannya sama sekali dengan kucing yang tinggal di kota itu. Minoes memberitahu Tibbe bahwa Meneer Smit, seorang warga senior di kota itu yang juga sangat dihormati, sangat sedih karena tidak ada seorang pun yang ingat bahwa sebentar lagi ia akan merayakan dua puluh lima tahun ia genap mengajar sebagai guru senior di kota itu. Sebuah berita fantastis, yang mampu menyelamatkan Tibbe dari pemecatan! Akhirnya, Minoes tinggal di rumah Tibbe. Ia tidur di kotak kardus bekas kaleng sarden yang dibeli oleh Tibbe. Meskipun awalnya Tibbe tidak berniat untuk menampung Minoes, karena ia sudah punya seekor kucing juga, tetapi Tibbe yang baik hati akhirnya tidak tega dan mengizinkan Minoes tinggal di sana. Lagipula, berkat Minoes Tibbe dapat menulis berbagai berita baru yang menarik dan membuatnya menjadi wartawan terbaik di kota itu. Jaringan Minoes yang luas membuat terbentuknya "Kantor Berita Kucing" yang secara rutin menyuplai berita kepada Tibbe. Tibbe menjadi orang pertama yang mengetahui berbagai berita di kota. Bahkan yang paling rahasia sekalipun. Hal itu membuat Tibbe mendapat pujian dari bosnya, dan membuatnya sedikit demi sedikit mampu mengurangi sifat pemalunya. "Apakah Minoes nama belakang Anda? Atau nama depan?" "Itu nama panggilan saya," jawab Minoes. "Dan apa nama belakang Anda?" .... "Saya rasa, saya tidak memiliki nama belakang." ...."Mari kita awali dari awal. Coba ceritkan tentang orangtua Anda. Apa pekerjaan ayah Anda?" "Ia berkeliaran," kata Minoes. "Saya tidak pernah mengenalnya. Saya tidak bisa menceritakan apa pun tentang dirinya." "Maaf?" Dokter memandangi Minoes melalui bagian atas kacamatanya. "Ia abu-abu belang. Ia sudah tiada. Terlindas." "Meninggal," gumam dokter tersebut dan ia menulis; Ibu Meninggal. "Bukan meninggal, terlindas," Minoes mengoreksi. "Ya, ia tidak melihat jalanan karena silau terkena sinar lampu depan truk trailer, tapi kejadiannya sudah lama sekali." "Saudara laki-laki atau saudara perempuan?" "Jadi kembar lima? Jarang terjadi." "Tidak juga," kata Minoes. "Sering kok. Tiga saudara saya diberikan kepada orang lain ketika kami berusia enam minggu. Tinggal saya dan saudara perempuan saya. Menurut si ibu, kami berdualah yang paling lucu." Lanjut ke cerita. Suatu hari, terjadi kejadian tragis yang menimpa si Burik. Ia dipukul dengan botol anggur yang masih penuh isinya, hingga kakinya terluka parah! Burik hendak mencuri ikan salmon di rumah Meneer Ellemeet ketika aksinya ketahuan oleh penghuni rumah itu. Meneer Ellemeet mengambil botol anggur yang masih penuh dan memukulnya dengan keras ke kaki Burik. Burik kabur terpincang-pincang dari rumah itu, tapi Meneer Ellemeet melepaskan anjing herdernya, Mars, yang dua kali membuat Minoes harus naik ke atas pohon. Burik yang pemberani berhasil mencakar hidung anjing itu sebelum kabur ke sebuah karavan tua, tempat ia dan anak-anaknya yang baru lahir tinggal. Di lain tempat di kota itu, terjadi juga sebuah peristiwa mengejutkan. Kios ikan si tukang ikan ditabrak oleh mobil tak dikenal hingga ia harus dirawat di rumah sakit! Kucing-kucing tentunya tahu siapa pelakunya. Dia adalah Meneer Ellemeet, yang dikenal oleh warga kota sebagai seorang pengusaha dermawan dan berbudi luhur. Ia juga menjadi ketua perkumpulan penyayang binatang. Siapa sangka orang seperti dia justru membuat seekor kucing tua menjadi pincang dan seorang lelaki penjual ikan masuk rumah sakit? Tibbe tahu bahwa kucing-kucing ini tidaklah berbohong. Tetapi ia tidak bisa menulis berita itu, karena kucing tidak bisa menjadi saksi. Sementara saksi yang ada tidak bersedia mengungkapkan kebenaran karena Meneer Ellemeet menyuap mereka. Hingga suatu hari, keenam ekor anak si Burik dibuang ke dalam tong sampah oleh Meneer Ellemeet yang dimintai tolong oleh Meuvrow Van Dam karena keenam ekor anak kucing kotor tidur di atas selimut usang yang bahkan sudah ia buang itu. Keenam ekor anak Burik hampir saja mati jika Minoes tidak bergegas menolong mereka. Kali ini, Tibbe benar-benar sudah tidak bisa menahan dirinya, hingga akhirnya ia menulis berita tentang kelakuan Meneer Ellemeet yang jauh dari kenyataan yang dilihat oleh orang-orang di kota itu. Berita Tibbe itu ternyata justru menjatuhkan dirinya. Tidak ada seorang pun yang percaya berita yang ia tulis, karena ia memang tidak memiliki saksi manusia. Ia bahkan dicerca oleh orang-orang karena memfitnah seorang warga kota yang tidak memiliki cela itu. Tibbe juga harus menerima ketika bosnya memecatnya, karena Tibbe menolak untuk menulis berita baik tentang Meneer Ellemeet dan meminta maaf kepadanya. Keadaan bahkan bertambah buruk ketika induk semang Tibbe mengusirnya karena ia sangat terganggu dengan para kucing yang senang sekali mengadakan rapat di atap rumahnya. Dapatkah Tibbe mengembalikan reputasi dirinya yang sudah tercoreng itu? Mampukah ia membuktikan kepada semua orang bahwa Meneer Ellemeet adalah seorang lelaki berdarah dingin yang tidak segan-segan melakukan kekerasan kepada hewan dan membawanya ke penjara karena menabrak si tukang ikan? Dan, apakah Minoes akan kembali menjadi kucing, setelah kakak perempuannya menemui dirinya dan tahu bagaimana cara mengembalikan dirinya menjadi kucing seperti sedia kala? Ataukah Minoes yang sudah semakin "berkemanusiaan" akan memilih menjadi manusia selamanya? Anda harus baca sendiri untuk tahu jawabannya. Kisah ini ringan tapi maknanya sangat mendalam. Cocok sebagai buku anak-anak, karena bisa mengajari mereka untuk mencintai binatang. Satu hal yang selalu saya sadari ketika membaca buku yang berkisah tentang hewan dan manusia adalah, bahwa manusia itu seringkali jauh lebih jahat daripada hewan manapun. Seperti kelakuan Meuvrow Van Dame yang tidak sudi selimut tuanya yang sudah ia buang menjadi tempat bernaung nyawa-nyawa kecil tak berdosa itu. Atau sifat si Meneer Ellemeet yang oportunis dan bermuka dua, yang hanya mementingkan kepentingan dan reputasinya sendiri, hingga menghalalkan berbagai macam cara untuk mencapainya. Buku ini adalah buku yang secara spontan saya beli karena melihat cover dan ceritanya. Awalnya saya nggak berharap banyak, tapi ternyata bukunya bagus sekali. Salut dengan Meuvrow Annie M.G. Schmidt, yang ternyata adalah maestro penulis anak-anak dari Belanda. Buku ini ternyata sudah difilmkan juga lho. Dengan judul Miss Minoes (Undercover Kitty). Обычно я не вписываю сюда книги, которые читала Лизе, но эта уж больно понравилась (впрочем, я не помню у Анни М.Г. Шмидт ни одной неудачной книги). I discovered the existence of this book thanks to a bookstore in the train station of where I currently live, of all the books they had displayed in English, this one caught my attention, it had a nice cover so I went to look at it and even read a bit. That "bit" turned out to be around twenty something pages in the end, I was waiting for my fiancé to come with the train and since it was cold I stood there in the bookstore reading away about Miss Minou and Mr. Tibble. I did not buy the book that I discovered the existence of this book thanks to a bookstore in the train station of where I currently live, of all the books they had displayed in English, this one caught my attention, it had a nice cover so I went to look at it and even read a bit. That "bit" turned out to be around twenty something pages in the end, I was waiting for my fiancé to come with the train and since it was cold I stood there in the bookstore reading away about Miss Minou and Mr. Tibble. I did not buy the book that day though. Few days later my fiancé surprises me with a random present that he had left in my school backpack when I was not watching. I had told him about the book and how lovely it seemed, but it was rather expensive so I did not buy it, however, he knows I love reading, in his sweetness he gave me this book as a gift. The book is easy to read and has a fun and original story to tell, without being the most special thing I have ever read, I truly enjoyed it. In the beginning I thought it would not really offer much apart from the daily lives of Mr. Tibble, Miss Minou, all the cats from the town and the town itself, in fact, reading about the rather mundane adventures of all these characters already proved to entertain me. But it does actually develop a more central story, since Mr. Tibble writes news articles in the local newspaper it is maybe natural that at some point some kind of bigger "scoop" is under the making, it was very interesting to see where it was all going to, and how it would develop. *Spoiler ahead* But I did wonder one thing... Miss Minou was originally a cat, I can imagine that if you are born being a cat, you would want to return to your original state, have quite some struggles as well, humans live so differently than cats. When I saw the hardships that the cat/lady went through I really felt sad for her, she made a marvelous cat, its human form just made her really cute, and helped Tibble quite a lot! Cats know a lot. The way the author portrays cats is splendid, they are indeed like that! So cold and self sufficient as well as kind and warm. It is so unusual to be able to give voice to a cat, I imagine the cat I used to have would have a similar way of speaking to the ones in the book, not as Miss Minou, but maybe as the Metropole cat. 3) It is a perfect length (not too long not too short) which means I can read it quickly enough to remember what’s happening but not so fast that I am finished too soon. 5) It’s about a cat and I love cats. And the book was just as good as I hoped. I loved how Minou was a cat who had transformed into a lady because it gives us the view of what a cat is, in a human’s form. Annie M. G. Schmidt is very clever at showing what makes cats different from humans by showing a human doing these things and having people (and cats) think that is a bit weird. The way Minou does both human things and cat things works really well because it means she can talk to cats to find out news for Mr Tibble and she can also talk to humans. She has human traits and catty traits – or, as she corrects Tibble, ‘cattish traits’. I loved how Minou slept in a box and she could climb on the roof and up trees. I wanted everything to work out in the end for Minou and Mr Tibble because they were both very nice and I would like to meet them. Kisahnya tentang Juffrouw Minoes, gadis yang dulunya kucing. Gara-gara makan “sesuatu yang salah” di bak sampah, ia pun berubah menjadi manusia. Walau sudah menjadi manusia, Minoes masih melakukan beberapa kebiasaan kucingnya, termasuk memanjat, saling menempelkan hidung dengan kucing lain, dan bernasib sial dikejar anjing. Dalam petualangannya, ia berkenalan dengan Tibbe, wartawan koran yang hampir saja dipecat. Sejak bertemu dan merawat Minoes, nasib Tibbe pun membaik. Banyak akal yang dilakukan Minoes untuk membantu Tibbe, sampai-sampai ia membentuk Kantor Berita Kucing. Minoes pun bekerja sama dengan kucing Monopool, Fluf, Burik si kucing preman, kucing Tukang Roti, kucing Deodoran, dan kucing-kucing lainnya. Bila ada waktu senggang, mereka pun menyanyikan mars kucing Meong-Meong sembari dilempari botol kaca oleh penduduk sekitar. What a lovely fantastical story. After a chapter, I was enchanted. I've read some Pushkin translated (children's) books before and been impressed. This title in English is 'The Cat who came in from the Roof'. Tibble, a journalist, is obsessed with cats and is about to lose his job unless he finds something news-worthy to report on. As luck would have it, he runs into a strange young woman stuck up a tree, scared of a dog. Minou claims to be a cat, turned inexplicably into a human. A very catlike What a lovely fantastical story. After a chapter, I was enchanted. I've read some Pushkin translated (children's) books before and been impressed. This title in English is 'The Cat who came in from the Roof'. Tibble, a journalist, is obsessed with cats and is about to lose his job unless he finds something news-worthy to report on. As luck would have it, he runs into a strange young woman stuck up a tree, scared of a dog. Minou claims to be a cat, turned inexplicably into a human. A very catlike, purring human. Yet she has contacts all round the town, a network of cats that might just be able to rustle up the news stories Tibble needs to keep his job. We meet cats who have their ear to the floor in Council chambers, the church, the school (he's my favourite). Minou's cat-like behaviour gets her in trouble repeatedly. Yet her information also allows Tibble to uncover all kinds of secrets, and it was a delightful read watching the cats of the town truly those with the knowledge of what is really going on. There's a mystery included in the story. There's deception and cat teamwork. It's a lovely modern fairy story that actually could be set in a contemporary small town or a Victorian world. It feels timeless. The writing is lovely, the translation good (though "That takes the cake!" made me giggle). This could make a delightful children's film. It's a little too difficult for a newly emergent reader but 8-11 year olds will enjoy by themselves, or with a grown up. I was excited to see this released in the U.S. after the movie adaptations, Miss Minoes, has been so popular at my library (I had to order a fresh copy as it circulated so much!). I admit, I haven't watched the movie. Yet. Mr. Tibble is a reporter at the local paper of a small town called Killenthorn. But he only writes about cats. After an ultimatum from his boss, Mr. Tibble MUST find something else. That's when he meets Miss Minou. Miss Minou is having her own problems--she used to be a cat but I was excited to see this released in the U.S. after the movie adaptations, Miss Minoes, has been so popular at my library (I had to order a fresh copy as it circulated so much!). I admit, I haven't watched the movie. Yet. Mr. Tibble is a reporter at the local paper of a small town called Killenthorn. But he only writes about cats. After an ultimatum from his boss, Mr. Tibble MUST find something else. That's when he meets Miss Minou. 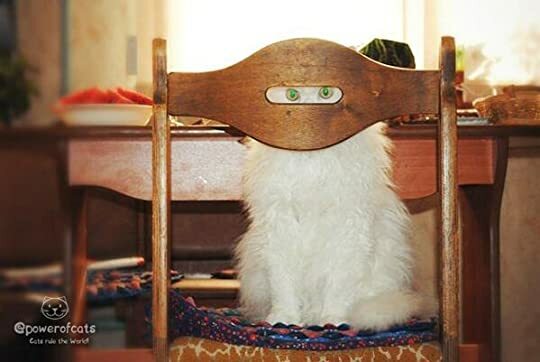 Miss Minou is having her own problems--she used to be a cat but after eating something out of an Institute's rubbish bin, she finds herself transformed into a human and kicked out of her house by her own sister. Fortunately, Killenthorn is full of cats and Miss Minou finds a place to stay with Mr. Tibble. Which works out for him, too, as the cat press network supplies him with tips for stories. This rings with a classic feel, something that I might have read and loved when I was younger. (It helps that I'm a cat person, too!) The author notes at the end tell us that Annie M.G. Schmidt was a popular Dutch children's author and her works are regarded as children's classics there. I can see why. It's just a sweet story with a magical feel to it with a good wins over evil message and also one of acceptance. This is a book about two adults and a network of cats. Too often kit lit assumes that children cannot handle stories about adults or they (the adults) are missing from the story entirely and the children know best about everything, suffer alone, usually prevail only because they are special or chosen in some way, and then the adults return at the end to scratch their heads in amazement that the children are so brilliant. The story is wonderful. There is a child in the story who is brave and smart and talented, but she is not the main protagonist. Instead, this is a coming of age story for one Mr. Tibble and a story of what it means to have a home for one Miss Minou. Mr. Tibble is a bit of a coward and must learn to overcome that when he sees a situation that requires him to be brave. Some of the adults in this story are terrible, and some are really quite good. What is most reminded me of was the feeling I had while reading 101 Dalmations. We just finished reading the most delightful book. It is a children's book but it can be enjoyed by grown ups too and other animals. Tibble is a very shy man who is in danger of losing his job as a reporter if he is unable to find real news stories rather than just writing about cats. Minou is a cat who has been turned into a human lady and is looking for a home. The two of them find each other and after a rocky start, they learn to rely upon each other. Minou, who runs the Cat Press Agency, shares the knowledge of the felines around town who know everything about everything. The cats tell Minou who then tells Tibble. All goes swimmingly until Tibble reports a sensational story that everyone doubts until the evidence proves him right. There are wonderful kitty characters who weave throughout the tale. Most of the humans are a bit on the dense side, but then they are only human. Everything works out in the end of this charming story. 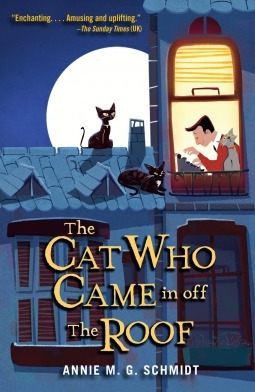 THE CAT WHO CAME IN OFF THE ROOF by Annie Schmidt is a sweet middle-grade fantasy featuring a shy newspaper reporter and the mysterious cat lady he befriends. When Tibble is told that he writes too many articles about cats, he sets out to find more news-worthy stories. When he rescues a woman from a tree, he soon learns that she’s actually a cat in human form and has a nose for news. Together, they make a great news team. However not everyone is happy when they uncover a story about a corrupt bus THE CAT WHO CAME IN OFF THE ROOF by Annie Schmidt is a sweet middle-grade fantasy featuring a shy newspaper reporter and the mysterious cat lady he befriends. When Tibble is told that he writes too many articles about cats, he sets out to find more news-worthy stories. When he rescues a woman from a tree, he soon learns that she’s actually a cat in human form and has a nose for news. Together, they make a great news team. However not everyone is happy when they uncover a story about a corrupt businessman. Originally published in the 70s, this Dutch classic has been translated for a new generation of young readers. Librarians will find an audience for this book among the many children who enjoy cat stories, light humor, fantasy, and a hint of mystery. To learn more about this author, go to http://www.annie-mg.com/. A delightful little book with talking cats! I was more than halfway through when I became curious about the book's origins, that was when I realized it was translated from Dutch. It has an older feel to the cadence and the vocabulary, but the plot is still relevant and interesting today. There is a little bit of mystery, quest for the truth, a cat-like lady, and a whole host of cat characters. Plus, in the end everything works out. I think this would be a nice family read-aloud (especially for a A delightful little book with talking cats! I was more than halfway through when I became curious about the book's origins, that was when I realized it was translated from Dutch. It has an older feel to the cadence and the vocabulary, but the plot is still relevant and interesting today. There is a little bit of mystery, quest for the truth, a cat-like lady, and a whole host of cat characters. Plus, in the end everything works out. Although she wrote a variety of poems, songs, books, plays, musicals, and radio- en television drama, she is known best for her children's literature, for which she received the Hans Christian Andersen Award in 1988. She committed suicide a day after her 84th birthday and was buried in Amsterdam.